WASHINGTON— Conservation and food-safety groups submitted a formal notice of intent to sue the Environmental Protection Agency today for failing to protect threatened and endangered species, including butterflies, amphibians and birds, from flupyradifurone, a newly approved systemic insecticide. The EPA recognized that flupyradifurone could harm wildlife protected under the Endangered Species Act but failed to consult with expert wildlife agencies as required by the Act before approving it on January 14, 2015. The new insecticide would be especially harmful to imperiled, solitary bees like the blue orchard bee. These agriculturally significant bees are prolific pollinators, already suffering from the effects of other systemic insecticides. 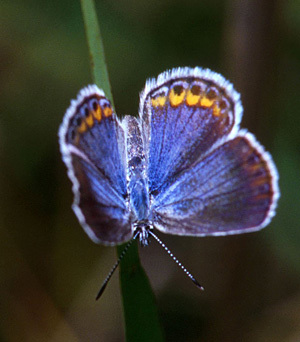 Karner blue butterfly photo by John and Karen Hollingsworth, USFWS. Photos are available for media use. Unlike other pesticides, which remain on the surface of plants, flupyradifurone is part of a new class of systemic insecticides that are taken up by the plant and transported to all plant tissues including leaves, flowers, roots, pollen and nectar. Systemic insecticides also include neonicotinoids, which numerous scientific studies have shown are one of the key factors driving the collapse of America’s bee populations. The federal agency failed to consider the highly toxic impacts of this new systemic insecticide on native pollinators such as butterflies and bees, and on a range of birds, amphibians, reptiles, mammals and aquatic invertebrates. While its own “acute oral toxicity study” indicates that flupyradifurone is highly toxic to individual adult bees, the EPA claims the product is safer for bees than other systemic insecticides because the highly toxic product will kill bees that ingest it in the field — unlike other systemic insecticides that are often carried back to the hive to poison whole colonies. While flupyradifurone may be “better” for honeybees and bumblebees than it is for solitary bees, there are 4,000 species of solitary bees living in the United States whose wellbeing the agency’s claim effectively ignores. The EPA’s own risk assessment recognizes that this pesticide is both persistent and mobile, meaning it will reach aquatic environments and put additional species at risk. For decades the EPA has approved hundreds of pesticides that can harm endangered wildlife without consulting expert wildlife agencies as required by the Endangered Species Act. In 2013 the National Academy of Sciences issued a report identifying problems and suggested solutions to correct the agency’s flawed approach for reviewing the impacts of pesticides on endangered wildlife. In approving flupyradifurone, the EPA failed to remedy the problems identified by that report and did not complete the required Endangered Species Act consultation. Center for Food Safety is a national, nonprofit, membership organization founded in 1997 to protect human health and the environment by curbing the use of harmful food production technologies and by promoting organic and other forms of sustainable agriculture. CFS maintains offices in Washington, D.C., San Francisco, California, Portland, Oregon, and Honolulu, Hawaii and has more than 600,000 members across the country. Defenders of Wildlife is dedicated to the protection of all native animals and plants in their natural communities. With more than 1 million members and activists, Defenders of Wildlife is a leading advocate for innovative solutions to safeguard our wildlife heritage for generations to come. For more information, visit www.defenders.org and follow us on Twitter @DefendersNews.